“Two, six, heave! Two, six, heave!” yells the first mate, and the crew rallies together to pull with all its might, hoisting the sails to set out on a journey on the vast ocean blue. There’s no feeling like crashing through the waves, steering at the helm, setting a course, flying up the ratlines and becoming an essential part of a crew. 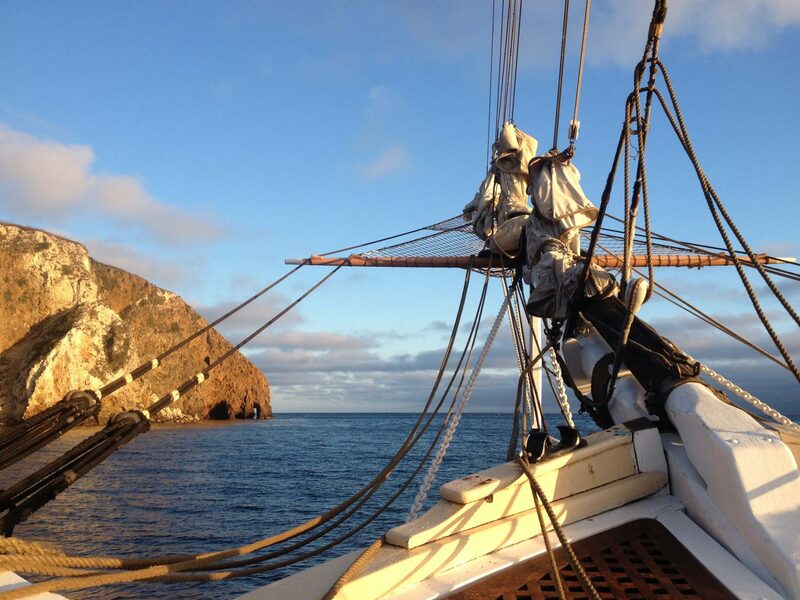 Whether on a schooner or a brig, today sailing onboard is truly an unplugged experience. Of course, when Richard Henry Dana, Jr. set sail, the unplugged aspect wasn’t a known label, and his experience was one of hard labor immersion. The mate’s boisterous chant harkens back to maritime expeditions in the ‘Age of Discovery’ with expanding colonial empires, establishing new trade routes and extending diplomatic relations to new territories. Along one of these routes, Dana, at 19, denoted our stretch of the California Coast as a bright ray of sunshine amidst the hide and tallow that permeated his surroundings. Beyond the glorious views, there was more to sail than heaving lines and tossing hides for the trades. Post discovery age came a new motive. Scientific curiosity fueled exploration. Yes, resources, or product, if you will, gave initial direction to the journey, but eventually science was the big ticket. Science established our understanding of the rich diversity the new lands possessed. It was discovered back in Dana’s era by sea-going naturalists that our ‘backyard’ kelp forests contain hundreds of species. When people think of scientific research, it’s safe to assume most visualize scientists in white lab coats peering into microscopes in a familiar laboratory setting. Rarely do we conjure images of sailing under blue skies perched upon the foremast to be ‘laboratories’ for data collection at its finest. Yet in the day, scientific documentation was achieved through sail. Think about it, a researcher, perched high upon the royal yard would have quite a wide view of the ocean. In our modern day, through the means of historic sail, the Brig Pilgrim and her mighty crew heaved through the Channel Islands several summers ago. A Topman at his lookout upon the foremast spotted blue whale after blue whale, minute after minute, hour after hour. Under full sail, he had the perfect vantage point to see the masterful blow of dozens that afternoon. A few seasons later, massive sightings of by-the-wind sailors (a sea jelly-like creature) were a minefield for the brig, and its crew fashioned the galley colander into collection equipment to grab a closer look before returning the critters to their home at sea. Tall ships and science go hand-in-hand; today we are fortunate to have options of a modern-day research vessel or an old school canvas and timber vessel. Still today, we pause at the awe of elegant sails on the horizon that remind us of a time when venturing to places unknown satisfied scientific curiosity. As crews cast off the bowlines and catch a bit of wind in the sails, the wide-open ocean is the laboratory.